Preconception screening aims to identify people who might be carriers of certain genetic traits. Some screening programs are conducted with specific ethnic groups with higher than normal chances for developing a particular condition. • A higher than expected number of people with ancestry from this region are carriers of one of four autosomal recessive genetic conditions: Autosomal recessive spastic ataxia of Charlevoix-Saguenay; Leigh syndrome, French-Canadian type; Tyrosinemia Type I; and Agenesis of the Corpus Callosum with Peripheral Neuropathy. • If one or both parents have ancestors from this region, there is a higher likelihood of both being carriers and thus a higher risk of their child having one of these conditions. 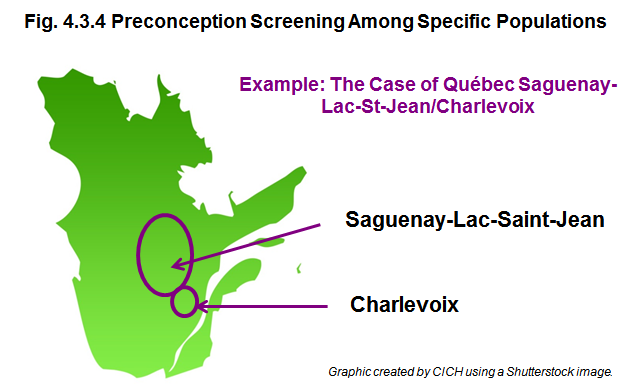 • The region has a pilot-screening program that offers combined carrier testing for the four diseases (representing about 20% of the population) to any adult over 18 years of age who is known to have at least one grandparent originating from this region of Quebec and who is planning to have children. • Screening is voluntary and must be initiated by the individual. • Screening is preceded by an information session discussing benefits and possible disadvantages of screening. Genetic screening programs require thoughtful planning, informed by engaging community stakeholders, to ensure benefit and to minimize any associated harms of genetic screening.